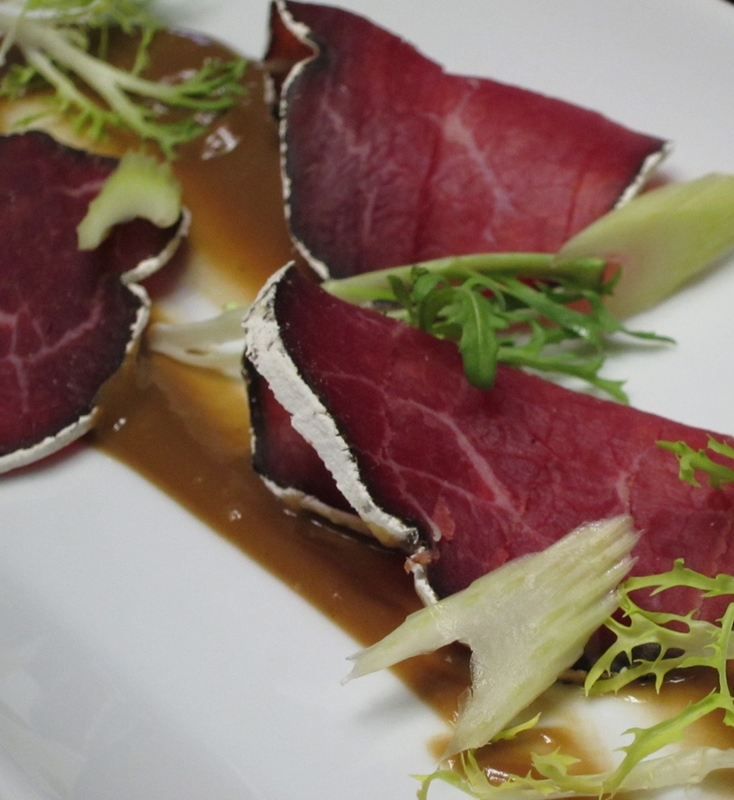 Much has been written in the blogsphere about the MC pastrami made from short rib or even better, beef cheek. Just Google it and you’ll get a lot of hits and pictures. 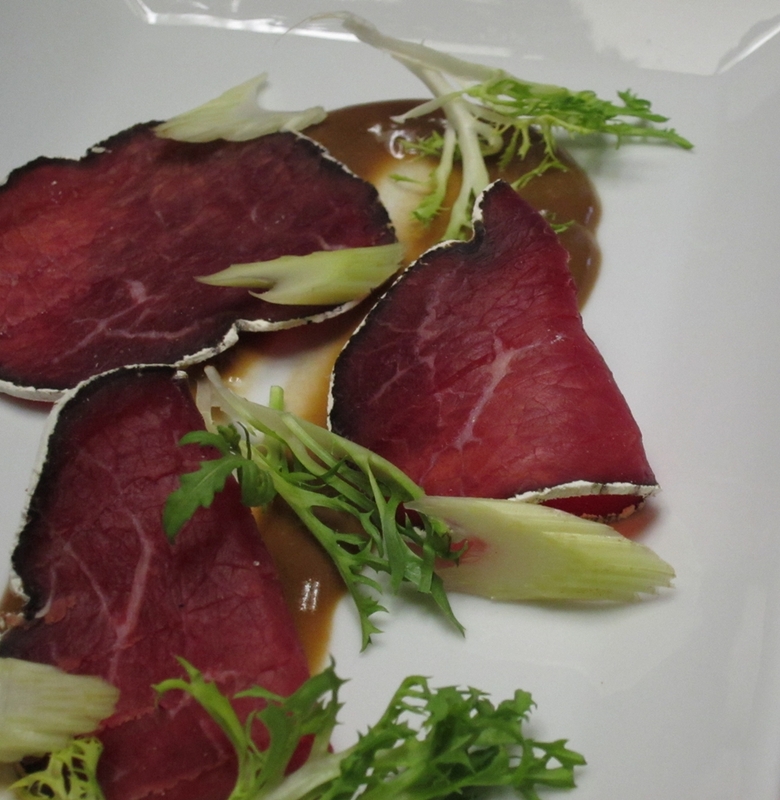 The attention is rightfully deserved since their process produces one delicious tasting piece of cured and smoked beef. 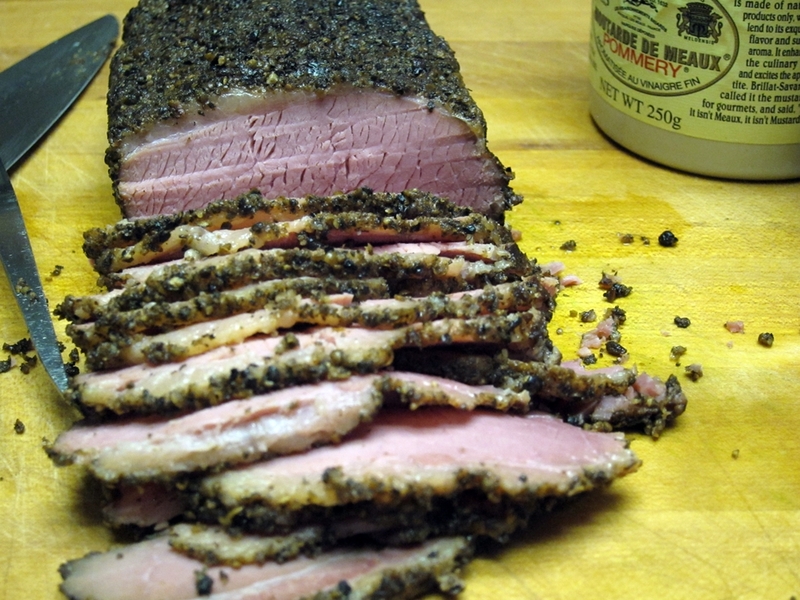 When done right, Pastrami is one of the tastiest cured meat products at American delis. The idea is to take a tough and a little fatty piece of beef (usually a brisket) and first soak it in a curing brine of salt, sugar, curing salt and a host of pickling spices. Up to this point it is not much different from corned beef. Just take it out of the brine and simmer it for a few hours and you got exactly that – corned beef. 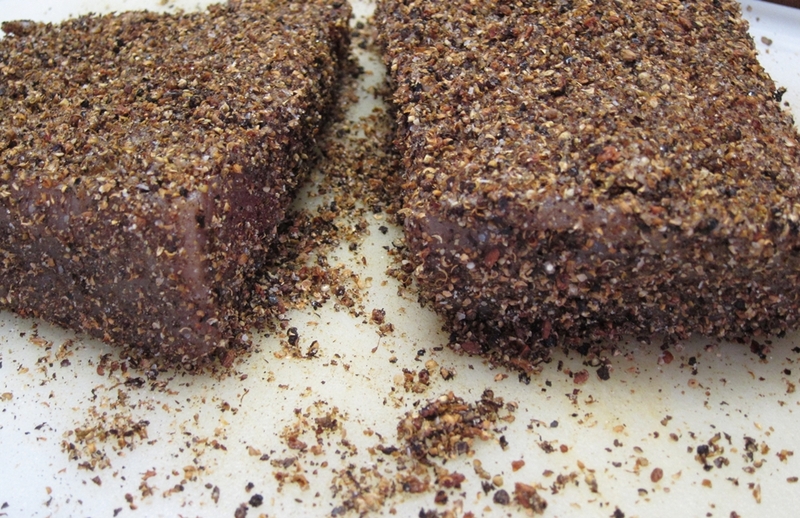 For Pastrami though, the next step is to roll the meat in a lot of spices (black pepper, coriander, celery seeds, juniper,..) and then smoking it for hours until cooked tender but not falling apart. We are still not ready to slice it though. The meat still has to go into the steamer to get an amazing unctuous and juicy texture. Now it’s sliced thinly and served piled high on rye bread. For the modernist version, the essential steps are still there, but the bulk of the actual cooking and softening the meat is done by cooking it sous vide. After the meat, brisket in my case, is brine-cured I rolled it in the spice mixture and then cold-smoked it for a few hours. To cook the meat I put it in a FoodSaver bag with some of the brine liquid (that was boiled and cooled) and then it went into the water with the immersion circulator set to 60 C for 72 hours. This cooking process is pretty much the same one that the MC team uses for their barbecue recipes: season/brine, cold smoke and then cook SV (I posted about this a while back here). Anyone who has seen Woody Allen’s great film Annie Hall knows that proper pastrami needs no add-ons. Poor Alvy (Allen’s character) almost has a seizure when Annie ordered her pastrami on white bread with mayo, mustard, lettuce and tomatoes! 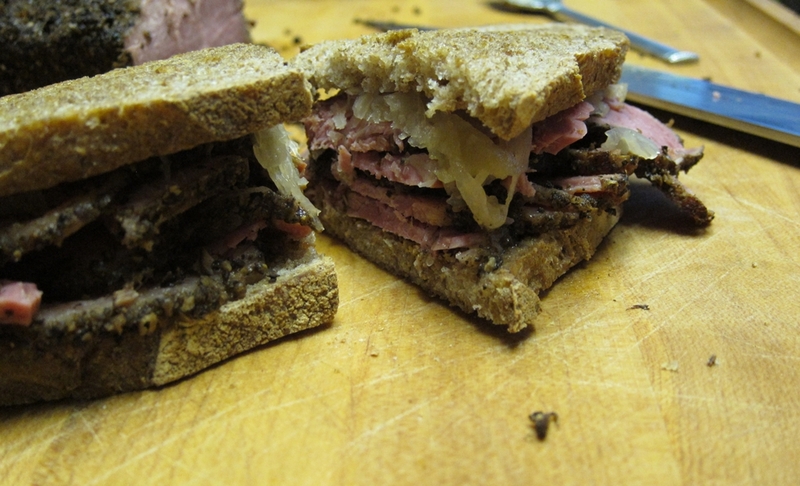 So, I served our delicious tender pastrami on homemade rye with a little mustard and sauerkraut. However, I can only have so many pastrami on rye sandwiches. 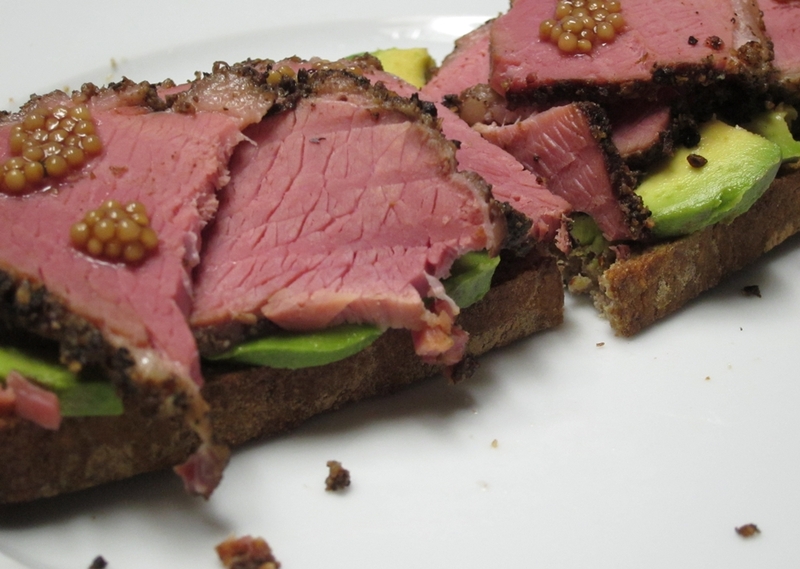 So, traditional or not, I served more of the smoked meat on top 0f rye bread topped with avocado and pickled mustard seeds. Either way, it was delicious. 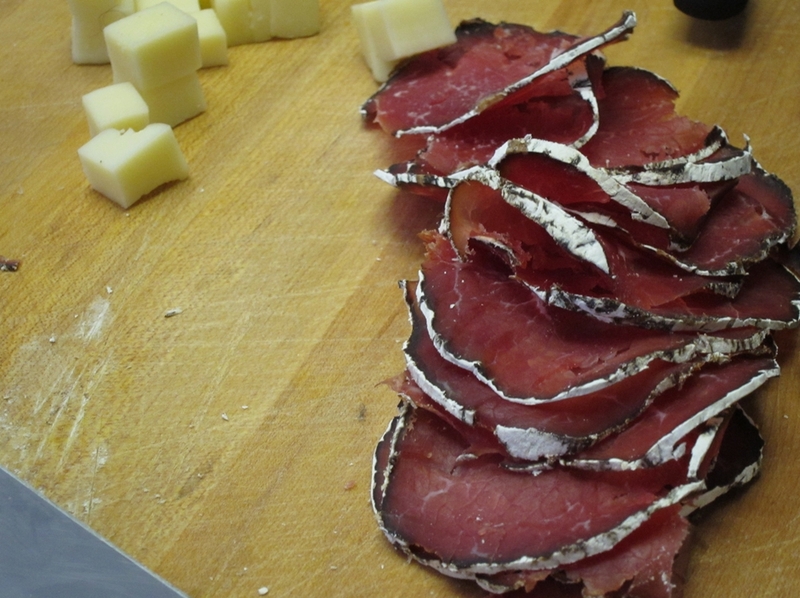 As opposed to the cooked pastrami, Bresaola is beef that is not cooked at all. I’ve mentioned this cured meat a couple of times before (here for example). This one from the MC books uses a cure with lots of ground coffee in it. They serve it sliced thinly with a sauce made from fermented black garlic (I used pressure cooked garlic confit instead) and balsamic vinegar. I was intrigued by the coffee in the cure…lots of it too. So I gave it a shot to see how it works out. When all said and done, I am not sure I love the coffee in there, especially if I am serving the cured meat by itself. On the other hand it really works well in the plated dish with the sauce, the sliced celery and some sharp greens.